According to a new market report titled IoT in Elevators Market -Global Industry Analysis, Size, Share, Growth, Trends, and Forecast 2018 - 2026, published by Transparency Market Research, the global IoT in elevators market is expected to reach US$ 50.76 Bn by 2026, expanding at a CAGR of 16.1% from 2018 to 2026. According to the report, the global market is expected to continue to be influenced by a range of macroeconomic and industry-specific factors. North America is anticipated to continue to be at the forefront of global demand, with the market in the region expanding at a CAGR of 15.3% during the forecast period. Technical advancements, increased digitization, increasing number of high-rise buildings, and presence of a large number of IoT in elevator providers are anticipated to drive the IoT in elevators market in North America. Based on component, the global IoT in elevators market has been segmented into hardware, software, and services. The hardware segment held significant market share, followed by services and software segments in 2017. However, services segment is projected to witness significant growth in the coming years and will hold major share of the market by the end of the forecast period. Hardware component includes M2M gateway or elevator gateway, designed for connectivity to the controller through data interfaces for remote monitoring of the elevator, which facilitates remote diagnostics to optimize work processes, time, and expenses. However, the software segment is expected to expand significantly over the forecast period due to the rapid increase in application of analytics software, IoT platforms, and security software. The report includes analysis of the IoT in elevators market by region, segmented into North America, Europe, Asia Pacific, Middle East & Africa, and South America. By end-user, the market is segmented into residential, commercial, and industrial. Growing demand for smart, IoT enabled elevators from the commercial sector, especially hotels, hospitals, transportation, and malls is anticipated to drive growth of the global IoT in elevators market in the coming years. Based on end-user, the commercial sector is a prominent user of IoT in elevators. This segment accounted for major market share in 2017 and is expected to hold its leading position over the forecast period. However, the market in the residential sector is projected to expand at a rapid pace in the near future. North America held a prominent share of the IoT in elevators market in 2017.The market in the region is anticipated to expand at a CAGR of 15.3% during the forecast period. In 2017, the U.S. held a significant share in terms of revenue of the IoT in elevators market in North America, followed by Canada. However, the market in Asia Pacific and South America is anticipated to expand at a significant CAGR in the coming years. The research study includes profiles of leading companies operating in the global IoT in elevators market. Profiles of market players provide details on company business overview, broad financial overview, business strategies, and recent developments. 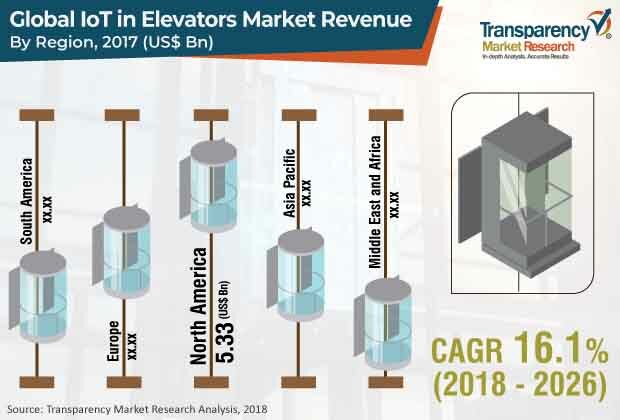 Some of the key players in the IoT in elevators market profiled in the study are ThyssenKrupp AG, KONE Corporation, Otis Elevator Company, Schindler Group, Mitsubishi Electric Corporation, and Toshiba Elevators among others.